Player of the Match – Mariam Samaroo collects her prize. 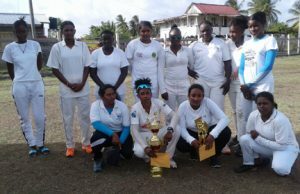 A brilliant performance from all rounder Mariam Samaroo spearheaded Rose Hall Town Metro Female Team to an easy 110 runs victory over West Berbice in the Final of the Berbice Cricket Board/Nand Persaud Co. 25-Overs Female Tournament. The powerful Rose Hall Town Metro Team led by West Indies Female Player Shemaine Campbelle were never under any pressure in the final and in the opening round had defeated New Amsterdam/Canje to advance to the grand final. Rose Hall Town Metro won the toss and elected to bat first on the lighting fast Hampshire Ground. West Indies training camp selectee Shabiki Gajnabi and Samaroo added 80 for the first wicket before Gajnabi was caught for a well played 68 which included seven boundaries and five huge sixes. Samaroo played within herself with a mature 44 (5 boundaries), while Oma Matadin 10 and West Indies batter Shemaine Campbelle 12 reached double figures as Rose Hall Town Metro reached 168 for 8 from their allotted overs. K. Fraser and Lafona Gilegous took 3 wickets apiece for 31 and 27 respectively, while Tremayne Smartt, playing as a guest player took 2 for 20. The winning RHT Metro Female Team. West Berbice in response had very limited opportunities to score freely as the powerful Rose Hall Town Metro bowling attack bowled very few bad balls. They were restricted to 58 for 7 in their 25-Overs, with none of their batters reaching double figures. T. Solomon and L. Fraser both top scored with 9. Samaroo returned with the ball to take 2 for 5, while West Indies left arm pacer Erva Giddings had 2 for 11. Plaffiana Millington, Dian Prahalad and Sherica Campbelle each took a wicket apiece. Berbice Cricket Board President Hilbert Foster praised Rose Hall Town Metro for emerging the Berbice Female Cricket Champion in the three teams Tournament. Foster also hailed the support of the Nand Persaud Group of companies for their continued support of cricket in Berbice. 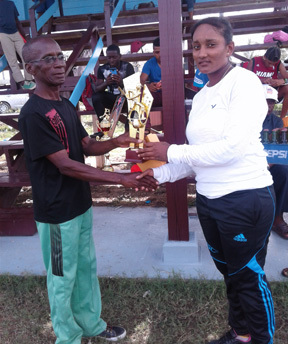 Special mention was made of General Manager Mohindra Persaud, who was described as a true friend of sports in Berbice. The BCB boss stated that while his Board was the only one in Guyana to organise female cricket in 2018, 2019 would see a minimum of three tournaments for females. He committed the Berbice Cricket Board to be very pro-active in promoting female cricket in the Ancient County and called on the female players to be more committed and discipline.